No. After only listening to the first chapter I decided to just read the book. The guy reading this book is the worst narrator that I've ever heard! He sounds Spanish instead of Irish and takes long pauses between each sentence. HORRIBLE! I thought perhaps something had gone wrong with my download but then I read everyone's reviews and found that it is indeed how this audio book sounds. Shame on whoever let this one through the screening process. A new narrator is a must! I loved the narrator for the 1st book in this series, Dark Witch. Why couldn't she have read this one as well? This guy....pauses...way...too....often. Did Shadow Spell inspire you to do anything? The narrator inspired me to read this book myself. What did you love best about Shadow Spell? The story itself is good, and I wish that I had just purchased the book and read it to myself. The narrator stops so frequently that it is distracting and annoying. What was one of the most memorable moments of Shadow Spell? Not very far into the story, but I may have to purchase the Kindle version to get through it. Please. Stop. Pausing. So. Often. It. Is. Painful. To. Listen. To. I would like to see them do something similar to what was done with Whiskey Beach (new narrator). I looked forward to this book coming out and now feel really disappointed. 60 sur 61 personne(s) ont trouvé cet avis utile. What did you like best about Shadow Spell? What did you like least? I was disappointed with the narrator choice for the first book in this trilogy, but her accent and pace were so much better than Alan Smyth's performance! I was at least able to listen to her for the whole of the first book versus shutting off this second book and switching to a nonfiction book on my commute to/from work. I wish I could say I finished this story, but I have to return this audio version and buy the Kindle one. What didn’t you like about Alan Smyth’s performance? I have never returned an audiobook on Audible but I can hardly stand the pauses, changes in the narrator's accent and complete lack of flow in this version. This is really not a good fit for this trilogy and his performance is so bad it's distracting. I would much rather prefer my favorite narrator, Susan Ericksen, or Patricia Daniels or Fiacre Douglas. The latter two narrators performed the Jewels trilogy and the Born In trilogy, respectively and they are fantastic! Please re-record this book with a new narrator like you did with Whiskey Beach! However, even the first narrator for Whiskey Beach is better than Alan Smyth performing Shadow Spell. The narrator! He is awful. I have gotten used to Nora Roberts books having better narrators. This one doesn’t even know how to make it sound like he’s not reading the book let alone have an Irish accent. I can’t listen to any more. I going to get the kindle book and finish reading it there! Haven't finished it yet. I'm going to read it on my Kindle. Who would you have cast as narrator instead of Alan Smyth? Susan Ericksen. She knows how to put life into characters and how to do an Irish accent. Would you try another book from Nora Roberts and/or Alan Smyth? From Nora Roberts, yes. Alan Smyth, no. What other book might you compare Shadow Spell to and why? Compare it to the first of the trilogy, Dark Witch, and there was a better narrator. Not perfect, as she made the Irish women sound like old ladies, but the American voices were better. And she could actually perform the book instead of reading it, and her accent was at least believable. Irish accent is off, the inflections are wrong, the colloquialisms not emphasized properly. I don't like his voices for the characters. He pauses too much in the narration, and doesn't "perform" the book so much as read it. Yes. Check the narrator before I order the last of the trilogy. I may just buy the paperback. So far the story is good, but I don't think I can stand to listen to the whole thing. I will buy the paperback and read it so the narration doesn't ruin it for me. 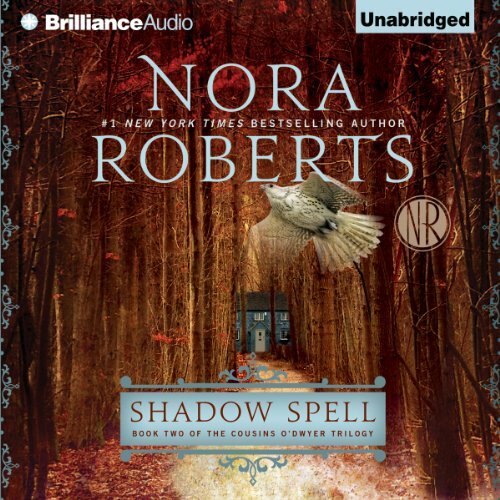 I can hardly listen to this title, although I am a devoted Nora Roberts fan, the narration is so awful. great story and was excited to get this new release but only on Chapter 7 and I can not stand the narration. I bought the kindle book and returned the audio. It was terrible. The narrator lisped, paused very awkwardly and just generally didn't put any emotion into his voice. I also couldn't tell who was talking because the voices all blended together. Would you listen to Shadow Spell again? Why? I agree with every one else. The narration is the most terrible I have ever heard. this needs to be re done and as soon as possible. I am not even half way thru and I think I am going to have to have a refund. I can not listen to this.